The two best things about this 80-page booklet are that it is in Spanish and it deals with the practical issues first- and second-generation Hispanics face when trying to become part of the U.S. Catholic Church. 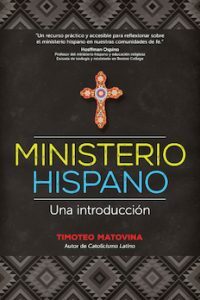 “Ministerio Hispano” (“Hispanic Ministry”) gives an overview of Hispanic Catholicism and how the U.S. church is trying to incorporate the influx of immigrants into a basically English-speaking, European-oriented religious culture. Being written in Spanish makes the booklet more accessible to recent immigrants and their offspring still uncomfortable in English. However, it easily can find an audience in bilingual Hispanics whose religiosity is rooted in Spanish although solidly planted in U.S. life. The booklet is basically a guide for Hispanics and Hispanic ministry leaders. It offers orientation for the specific situations faced by Hispanics and a brief history tracing Hispanic Catholicism in the United States. It is a reminder that Hispanic Catholicism and culture are not something new and have a long history of contributions to U.S. Catholicism and culture. The booklet is not a catechism. Author Timothy Matovina is well-versed in Hispanic Catholicism and has written extensively on the topic in English and Spanish. He is co-director of the Institute for Latino Studies at the University of Notre Dame and a theology professor at the school. The booklet shows that the growth of the U.S. Hispanic community already has had a tremendous impact on the Catholic Church. Masses in Spanish, processions and Marian feast days celebrating Latin American patronesses are just some examples. In addition, Hispanics have been the motivating force in the Cursillo and charismatic renewal movements. Out of U.S. Catholic population of 68 million, over 30 million are Hispanic. At the same time, this phenomenon has presented challenges to U.S. church leaders. How do you incorporate this different culture, language and religious attitudes into current parish and other church structures? The answer is not simple for a variety of reasons outlined by Matovina. He discusses the tensions arising in parishes between newly arrived Spanish speakers and the English-speaking establishment often fighting for a share of limited parish resources. He outlines the problems that can arise between apostolic movements and parishes when each claims a patrimony over believers. Also dealt with is the fact that Hispanic youths are not a monolith but include predominantly Spanish speakers, predominantly English speakers and bilingual youths with a foot in both cultures. Matovina does not try to solve these problems. He presents the various viewpoints involved and then lists questions to stimulate group discussion. The approach is symbolic of the situation as one size does not fit all and effective Hispanic ministry has to deal with a lot of open-ended questions. Bono, a retired CNS staff writer, covered Hispanic affairs.